Hellyeah returned to the studio at the start of January to begin putting the pieces in place for the follow-up to 2016’s Undeniable. It’ll feature late drummer Vinnie Paul, with Kyle Sanders previously telling SiriusXM that the drummer had finished recording his parts for the record before his death in June last year. The band recently shared three clips from the studio – and now they’re asking fans to get involved in a tribute to the late drummer. Earlier this week, Grammy Award bosses were criticised for not including Vinnie Paul in their annual ‘in memoriam’ section – a decision which drew the ire of Halestorm’s Lzzy Hale. 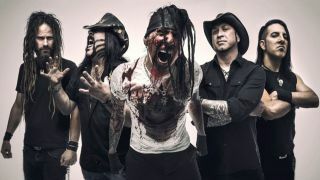 Further details on the new Hellyeah album will be revealed in due course.